Zoltrog engaged the 51st revolution of your planet around your sun since the Grammy awards were conceived, assisted by a container of popped corn kernels and a recent Earthling invention known as the Snuggie. 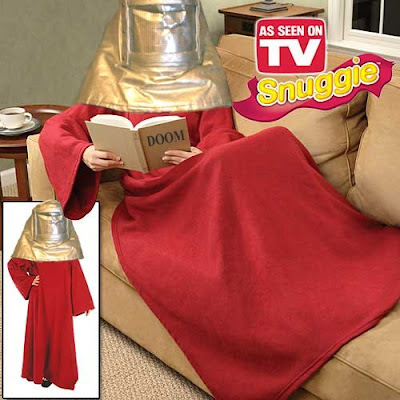 Even on the brink of your planet's doom, the Snuggie provides sustained comfort and keeps my limbs and appendages mobile thanks in part to its backside entry... or so was muttered by her. Oh, snap, Zoltrog. Zoltrog however was angered by the Grammys once again ignoring contributions from the intergalactic community, specifically Klembot the Vocahydrolyzer. Klembot's rendition of "Bloody Husk of Mammal Planet" leaves some on Zoltrog's homeworld in tears. You have been warned, Grammy humans. This addition to the electronic journalary archive will be followed by an angry letter from Zoltrog, written in the blood of the first mammal encountered on this day! Human Katy Perry may stay, but the rest must go! Your hatred of humanity must really be great to insist upon Katy Perry's continued presence amongst the rest of us. If ever I doubted your commitment to our destruction, I do no longer. It is truly impressive.